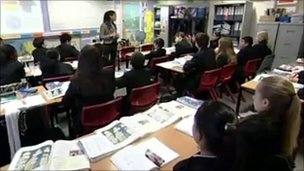 There has been a dramatic fall in number of children being expelled and suspended from schools in England. The rate of permanent exclusions (expulsions) fell by 19.4% in 2008-9 compared with the previous year, official figures show. The government says much of the fall has been due to schools and councils trying to avoid exclusions by moving pupils. The most common reason for exclusion was “persistent disruptive behaviour”. Under Labour, schools had been encouraged not to expel pupils but to work with other schools to arrange “managed moves” for children in danger of being permanently excluded. In total, there were an estimated 6,550 permanent exclusions from primary, secondary and special schools in 2008-9. That represents 0.09 per cent of the number of pupils in schools (nine in 10,000). There were 307,840 suspensions (fixed term exclusions), a 5% drop on last year. The average length of time for a suspension in secondary schools was 2.6 days. The figures show the rate of exclusion at academies continues to be higher than in other state-funded schools, although that has also fallen. The rate of permanent exclusion at academies is 0.31% (a decrease from 0.42% in the previous year), while the rate for suspensions is 13.5% – similar to the rate for last year. Across all schools, boys were more than three times more likely to be expelled than girls. They were also more likely to be excluded at a younger age. Pupils with special educational needs and on free school meals were also more likely to be excluded. The rate of permanent exclusion was highest among the Gypsy/Roma, Irish traveller and Black Caribbean ethnic groups. Black Caribbean pupils were three times more likely to be permanently excluded than the school population as a whole. Schools Minister Nick Gibb said: “Despite the fall in exclusions, poor behaviour remains a significant problem in our schools. Tackling poor behaviour and raising academic standards are key priorities for the Coalition government. “We trust teachers and that’s why we have already announced a series of measures to put head teachers and teachers back in control of the classroom – including ending the rule requiring schools to give 24 hours written notice for detentions and increased search powers. Shadow schools minister Vernon Coaker said: “These figures show that exclusions from schools were falling sharply under the last Labour government, because we were working with teachers and schools to get to grips with indiscipline in our schools. Alison Ryan, education policy adviser at the Association of Teachers and Lecturers (ATL), said: “We are pleased that there has been an overall fall in the numbers of pupils excluded from school, but it is disheartening that children from disadvantaged families are still more likely to be excluded than their peers. “Schools need more training plus support from the social and health services to help them reduce exclusions among pupils with SEN, those receiving free school meals, from Black Caribbean and Gypsy and Traveller families.